Why Is Data Journalism Important? Election results provide a great visual storytelling opportunities for any news organization, but for many years this was an opportunity missed for us. In 2008, we and the graphics desk set out to change that. We wanted to find a way to display results that told a story and didn’t feel like just a jumble of numbers in a table or on a map. In previous elections, that’s exactly what we did. Not that there is anything wrong necessarily with a big bag of numbers, or what I call the “CNN model” of tables, tables and more tables. It works because it gives the reader pretty much exactly what she wants to know: who won? And the danger in messing with something that isn’t fundamentally broken is significant. By doing something radically different and stepping away from what people expect, we could have made things more confusing, not less. In the end, it was Shan Carter of the graphics desk who came up with the right answer, what we eventually ended up calling the “big board”. When I saw the mockups for the first time, it was quite literally a head-slap moment. What makes this a great piece of visual journalism? To begin with, the reader’s eye is immediately drawn to the big bar showing the electoral college votes at the top, what we might in the journalism context call the lede. It tells the reader exactly what she wants to know, and it does so quickly, simply and without any visual noise. Next, the reader is drawn to is the five-column grouping of states below, organized by how likely The Times felt a given state was to go for one candidate or the other. There in the middle column is what we might call in the journalism context our nut graph, where we explain why Obama won. 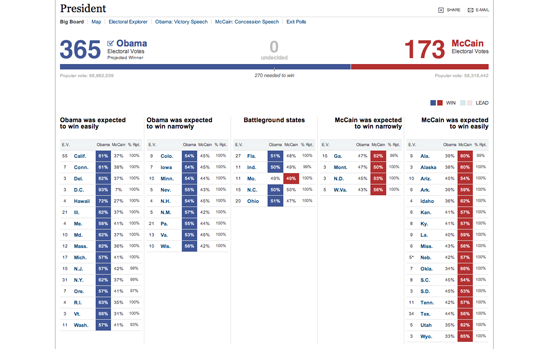 The interactive makes that crystal clear: Obama took all the states he was expected to and four of the five toss-up states. To me, this five-column construct is an example of how visual journalism differs from other forms of design. Ideally, a great piece of visual journalism will be both beautiful and informative. But when deciding between story or aesthetics, the journalist must err on the side of story. And while this layout may not be the way a pure designer might choose to present the data, it does tell the story very, very well. And finally, like any good web interactive, this one invites the reader to go deeper still. There are details like state-by-state vote percentages, the number of electoral votes and percent reporting deliberately played down so as not to compete with the main points of the story. All of this makes the “big board” a great piece of visual journalism that maps almost perfectly to the tried-and-true inverted pyramid. Don't miss any updates about the Data Journalism Handbook and other data journalism resources.